Our Baby Area comprises of 3 separate rooms for babies in each stage of their development, with each room dedicated to fun and stimulating activities for that age group. Our Baby Rooms offer a homely and loving atmosphere to welcome and meet your baby’s every need. We work in close harmony with parents to adapt to the way you care for your baby at home. Beginning from an early age babies begin to learn about themselves and their environment developing basic intellectual, physical, social and sensory skills that they continually use throughout their lives. In each baby room, there is a large selection of equipment chosen to encourage and stimulate your inquisitive baby. Everything we do is designed to give your baby the best possible standard of care. A daily diary will be completed by their key person to inform parents of their baby’s activities and care throughout the day. Children develop close relationships with staff through our key person system and lots of cuddles! 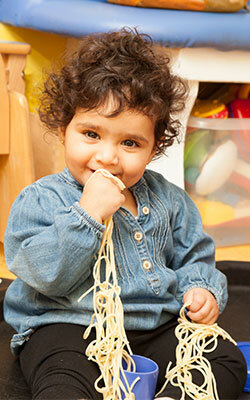 We provide an array of sensory activities to promote development. Our Baby Area also includes their own dedicated nappy changing area, milk preparation kitchen and separate outdoor baby garden. During the last 3 and a half years she has been extremely happy and has made many friends. We would like to express our gratitude to the entire team for helping our precious little daughter take her first steps towards her future. What she has learnt during her time with you has been invaluable and we can honestly say that you have had a big hand in making her the confident ‘little madam’ that she is today. I am sure she will always remember Shanklin Day Nursery in Stoneygate, Leicester and all the staff with a lot of fondness and love. Shanklin Day Nursery and Pre-school is a private, family run nursery in Stoneygate, Leicester. We cater for children aged 0-5 years for 51 weeks of the year and have consistently excellent Ofsted reports.